Ideally, the best weed killers will kill just the weeds and leave all of your lush, green grass unscathed. The best one is the best for your situation. However, many are made with potentially dangerous chemicals, so be sure to take precautions to avoid inhaling the weed killers, and wear gloves to avoid contact with your hands. If you have pets or small kids who often play on the grass and you need to cover a large area, your best weed killers may be the ones that don't come straight from the store in a convenient spray bottle. There are formulas that you can make at home, organic mixes, and even torching options. For others who are less concerned with chemicals, some mixes are expensive but reviewers rave about their effectiveness. Based on 46 reviews at Epinions.com, Round-up is one of the best weed killers out there. It's safe for family and pets one hour after it's sprayed as long as it's used on a sunny, calm day when it can dry in the allotted period of time. You can choose a foam or stream setting and will see results in about two days. As with most weed killers, you'll need to be careful about getting the product onto surrounding grass you'd like to keep. According to Galt Tech, Burnout Weed Killer RTU 24 is an excellent option for those who are interested in using an organic weed killer. The product contains vinegar and lemon juice as well as other ingredients. It also only takes a few minutes to do the job. Amazon.com reviewers give it 4.5 of 5 stars overall. This one gets 4.5 out of 5 stars and it doesn't use chemicals to kill weeds. You'll still need to be careful because it's an open flame, but Amazon.com reviewers claim that it's effective, affordable, multi-functional (one reviewer said she uses it for ice removal), and fun. They also mention that it lasts a long time. Ortho Weed B Gon gets positive reviews on sites from Epinions to ViewPoints.com for ease of use, price, effectiveness against several types of weeds (though it sometimes takes a little longer than other products to complete the job), and how long the results last. Users do point out that you need to be careful about where you spray this product, as it can kill grass along with the weeds. Lawn Weed Killer Concentrate is recommended by GaltTech.com. The site claims that it will kill 66 types of weeds including clover, chickweed, and dandelions--but not your lawn. Homeowners don't necessarily want chemicals on their lawn for a multitude of reasons. 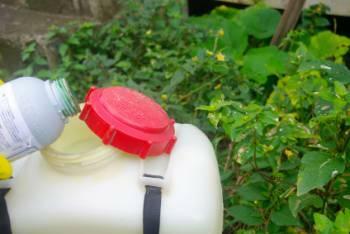 Vinegar is said to kill weeds without harming the environment. Some use it alone while others mix up concoctions of equal parts gin, vinegar, and liquid soap. Another natural option is rock salt (Caution - this will kill any plant life).